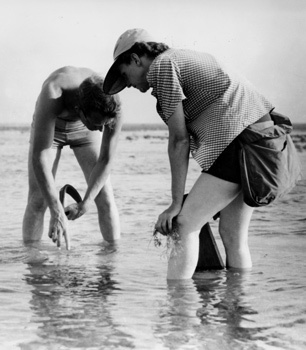 Rachel Carson brought the environmental hazards of DDT to public attention with her 1962 book, Silent Spring. Dichlorodiphenyltrichloroethane (DDT) is an insecticide that was widely used from the 1940s through 1960s, until being banned due to environmental concerns in the early 1970s. The chemical is well-known because of Rachel Carson's 1962 book Silent Spring and the environmental movement that it inspired. Today, DDT is still used in some countries to control diseases spread by insects, such as yellow fever, typhus and malaria, when the risks associated with using the chemical are considered to be less than the risks associated with the disease. DDT is a persistant pollutant; when it makes its way into the environment, it can remain there for very long periods of time—over 15 years, according to the EPA. It is also readily absorbed by animals, where it bioaccumulates in fat. This stored DDT can be transported throughout the environment, and transferred up the food chain. Most human exposure is expected to occur through food. Althought DDT is of great environmental concern, it is less so for residential water treatment. It adsorbs readily to soil and sediment in water, and concentrations detected in drinking water—even during the height of its use—have been typically very low. Long term exposure to DDT can have harmful effects on the liver, nervous and reproductive systems. It is also likely carcinogenic to humans; it has been shown to be carcinogenic in animal studies, but the International Agency for Research on Cancer has determined that there is so far insufficient evidence to determine for certain whether it is carcinogenic to humans. The World Health Organization recommends that coagulation or granular activated carbon (GAC) be used for the water treatment of DDT.